The Indian Ringneck Parrot or Parakeet (Psittacula krameri manillensis - Bechstein, 1800) - is also sometimes referred to as Rose-ringed Parakeet or, simply, Ring-necked Parakeet. Their average lifespan is 15 years. However, some live as long as 25 - 30 years. 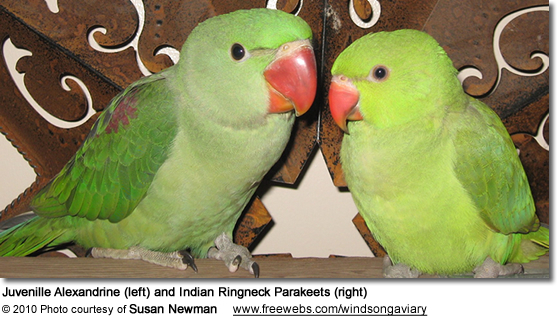 The Indian Ring-necked Parakeet originates from southern India. Its closest cousin - the African Ringneck Parakeet - is found in West Africa to Southern Sudan. It is one of four recognized subspecies of Ring-necked Parakeets - and is the most commonly kept in captivity. These elegant and beautiful birds can make good pets for pet owners who are willing to provide ongoing obedience training. If not given sufficient attention, the Indian Ring Neck may become unfriendly and disobedient. In order to maintain their friendly personalities and tameness, regular handling and socialization are a must for these birds. 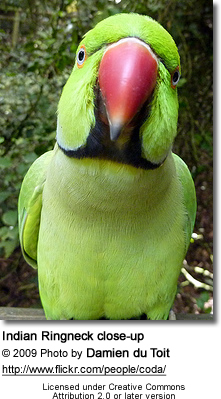 The plumage of the Indian Ring Neck is apple green, although mutations in a range of other colors also exist. This includes buttercup yellow and the increasingly popular powder blue. United Kingdom - the largest numbers are found around south London, with populations occurring in or around Battersea Park, Richmond Park, and Hampstead Heath. Smaller flocks occur in Esher (South East England in the Greater London Urban Area), and Berkshire (South England); as well as Margate, Broadstairs and Ramsgate, Kent. Small groups are occasionally seen in Dorset, Kensington Gardens (London), South Manchester and Studland). Belgium, Spain, Canary Islands, etc. They originally lived in semi-desert, wooded or forested areas; but have also adapted well to human-modified habitats, such as farmlands, cultivated agricultural areas and parks and gardens in villages and towns. The social Indian Ringnecks often congregate in large, noisy flocks at favorite roosting sites. Like all parrots, they are noisiest in the mornings and evenings. The Indian Ringneck Parakeet is a medium-sized parrot that measures between 14 - 17 inches (36 - 43 cm) in length - about half of which are the long tail feathers alone. The wings are 6 - 7 inches (153 - 180 mm) long. They weigh between 4 - 5 oz (115 - 140 grams). This parakeet has a long tail and a hooked beak. The upper beak is orangey-red with a black tip; the lower bill is blackish with a paler tip. The irises are pale yellow. The legs and feet are ashy-slate to greenish-slate. The original plumage coloration (and the color mostly found in the wild within their natural range) is green with a yellowish or bluish-grey hue to the lighter-colored under plumage. 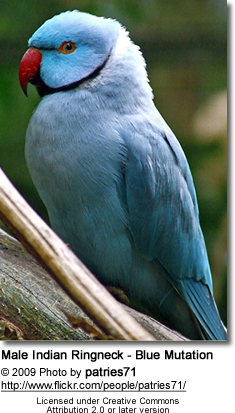 The nape (back of a bird's neck) shows a blue suffusion that can at times extend to the back of the head. The outer tail feathers are green. 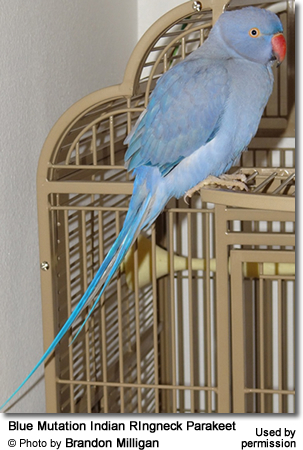 The blue central tail feathers have yellowish-green tips. There is a black stripe running through the chin area. Thirty or more striking and beautiful color varieties have been bred in captivity, such as lutino (yellow) and blue varieties, albinos, violets, olives and pieds. (Please refer to the photos on this webpage). Males and females look mostly alike; however, mature males (excepting some of the color mutations) can be identified by the ring around the neck, which consists of a thin black band that runs from the above the bill to the eyes and a wider black band that extends from the lower bill, getting thinner on the sides of the neck where it combines with the rose-pink collar that stretches over the back of the neck. In Blue-mutation males, the rose-pink collar is replaced by white. The female generally doesn't have the black line on the chin or throat, or the rose-colored band; however, a very pale ring might occur. 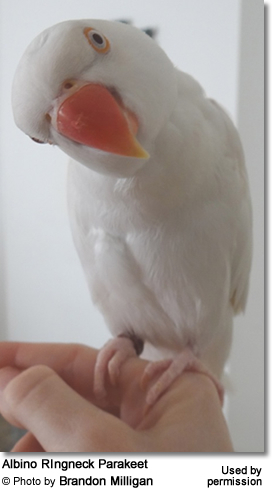 Surgical or DNA gender testing is recommended for younger birds or mutation birds that don't show the tell-tale ring around the male's head (such as albinos). Juveniles look like females, but the plumage is generally duller. They lack the black ring, pink collar, or blue tint on the back of the head that can be seen in the adult male. Juveniles attain the adult plumage when they are about 2 - 3 years old (usually in the spring of the third year). However, some males show traces of the ring when they are as young as one year old. 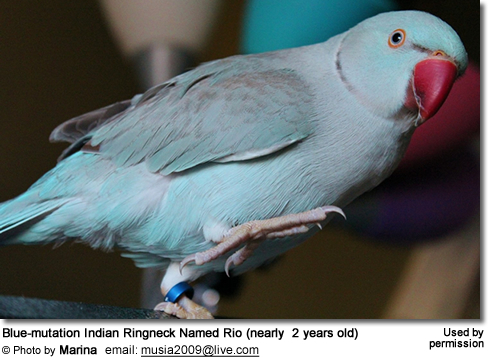 Resembles the related African Ringneck Parakeet, but is larger in size. The face is a stronger green. The Indian male's collar is less prominent on the African male. The African Ringneck has a longer tail. 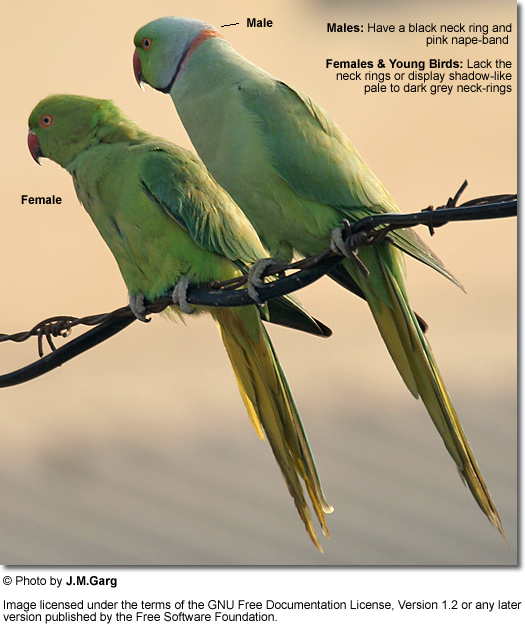 Within their natural range, Indian Ringnecks mostly breed between February and March, although some breeding activities have been observed in April. Most parrot species mate for life; however, this is not the case with the Indian Ringnecks. 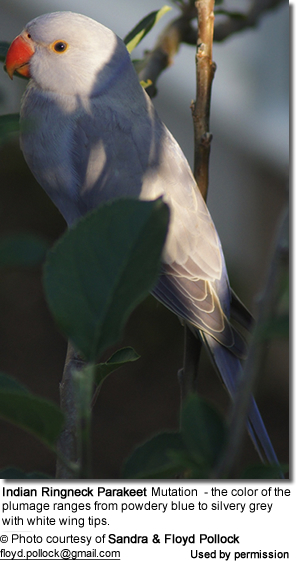 They nest in tree cavities - either natural or excavated by the birds themselves using their beaks and claws. If they excavated the nest cavity themselves, the entrance hole is usually a circular, ~2 inch + opening. They may use the deserted nests of Woodpeckers and Barbets. They may even take advantage of holes in old walls and buildings to make their nests in. The average clutch consists of 2 - 6 whitish eggs. These eggs are incubated for about 22 - 24 days. The young fledge when they are about 6 - 7 weeks old. 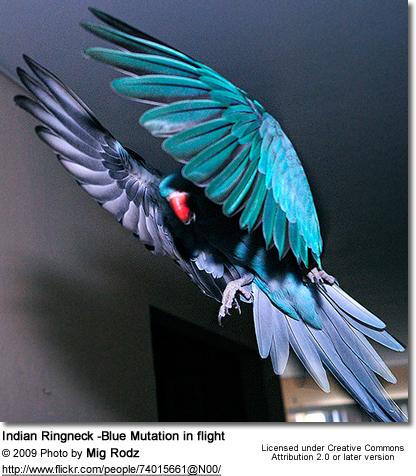 Indian Ringnecks reach reproductive maturity when they are about 1 - 1 1/2 years old. However, they may not breed until they are 2 to 4 years old. Females may successfully start breeding as early as 1 year and males at 2 years. 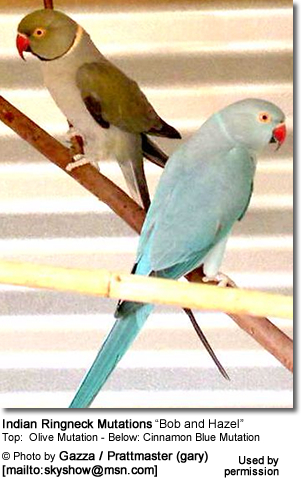 These beautiful parakeets are generally hardy once established in an aviary. They are generally good parents and can be a good choices for those wishing to start breeding larger birds. Since they don't form close pair bonds, they are easy to pair up, split up and re-pair, if necessary. The fact that they come in a wide array of beautiful mutation colors is also a big draw for breeders. The actual act of mating is preceded by a long and involved courtship that involves the male feeding the female, "dancing" and bowing. 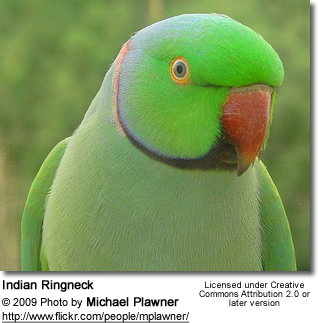 Indian Ringnecks will hybridize with related parrot species, such as the Alexandrine Parakeet and the Moustached Parakeet.